They carry an impressive set of curved trophy horns, with a length per horn of 18″- 25″ on a very big bull. The diameters vary from 10″- 14″. The horns of a mature bull have a lot of grooves and ridges on the base of the horns whilst the tips are more slender and smooth. The colouring of the Banteng make them a beautiful trophy, with a mature bull being black in colour with white rump markings and the lower half of the legs are also white. Very old bulls can sometimes be a brown and grey colour. Cows are a tan or brown colour with the same white markings, however their horns are much smaller. 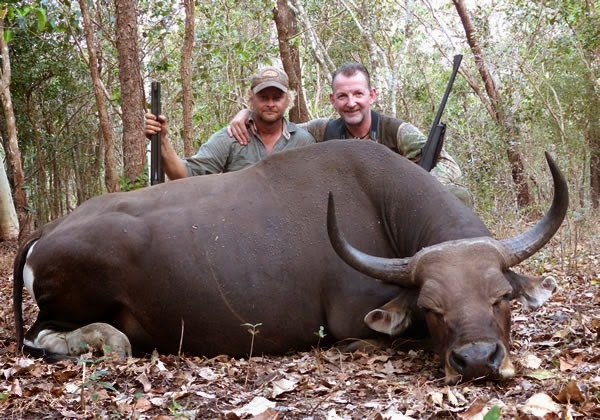 Hunting Banteng is done by a similar method to buffalo. Driving in the mornings and afternoons to areas where they are feeding or watering. Then following tracks or game trails from there on. The shooting ranges are generally quite close from 40 – 80 metres. Banteng carry an impressive set of curved trophy horns, with a length per horn of 18″- 25″ on a very big bull. The diameters vary from 10″- 14″.